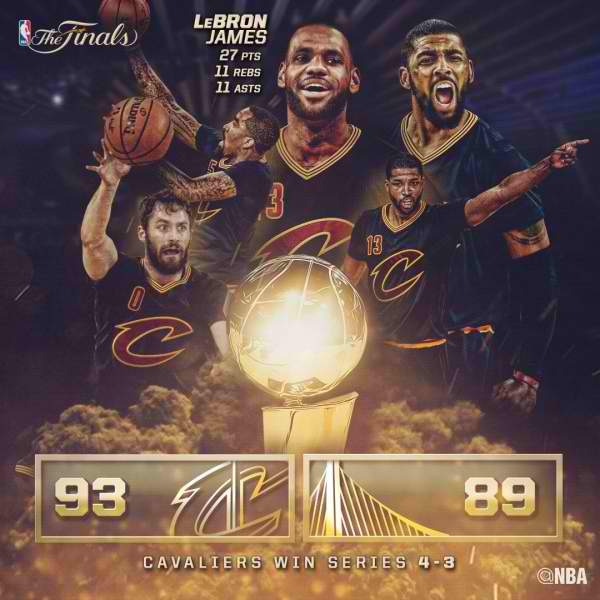 Game 7 Highlights: Cavaliers win 2016 NBA championship, defeat Warriors 93-89 (2016 NBA Finals) - Balita Boss! History has been made! LeBron James' legacy has been cemented. The Cleveland Cavaliers pulled off an improbable NBA Finals comeback by beating the Golden State Warriors 93-89 in an epic Game 7. They became the first team in NBA history to come back from a 3-1 deficit and win their first championship in franchise history. James carried the Cavs back into this series and finished with 27 points, 11 assists and 11 rebounds. He was named Finals MVP. Kyrie Irving, who buried the biggest shot in the final minute - a step-back three-pointer in Stephen Curry’s face, scored 26 points. Draymond Green tried to carry the Warriors with 32 points, 15 rebounds and nine assists. Curry, the back-to-back season MVP, had 17 points on 6-of-19 shooting and 4-of-14 from three. Klay Thompson had 14 points on 6-of-17 shooting overall and 2-of-10 from long range. Top 5 Plays from Game 7 of the 2016 NBA Finals!